Katarmal Sun Temple is at an altitude of 2116 meters above sea level, in the Kumaon Division of Uttarakhand, India. Sun temple in Katarmal built in the 9th century Katarmal near by Almora has the Second important Sun Temple in the country, the first Sun temple being the Konark Sun Temple in Orissa. 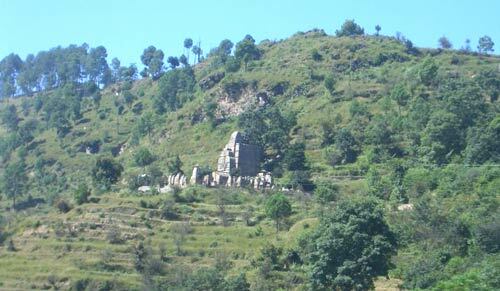 Katarmal Sun Temple is Situated 7 Kms from Almora, Uttarakhand. Katarmal Sun temple is around 70 kms away from Nainital. Katarmal Sun temple was built by KATARMALLA, a Katyuri Raja, in the 9th century. In the early medieval period, Kumaon was ruled by the Katyuri dynasty. The Katarmal Sun Temple is a monument of historical importance and also is an example of intricate sculpturing. The first rays of the sun falls straight on this Sun Temple. The main deity of the Sun temple in Katarmal is called Burhadita or Vraddhaditya (the old Sun God). The idols of Shiva-Parvati and Lakshmi-Narayana are also found in this temple. Katarmal Sun Temple complex has one main temple, surrounded by 45 smaller shrines exquisitely carved temples surrounding it. However, the intricately carved doors and panels have been removed to the National Museum in Delhi after the 10th-century idol of the presiding deity was stolen. The Katarmal Sun temple, noted for its magnificent architecture, artistically made stone and metallic sculptures and beautifully carved pillars and wooden doors, the image of Surya in the temple dates back to 12th century. The Katarmal Sun temple has some unique architectural style and the images carved on the walls are very intricately done. Though amidst ruins, it still stands as a major point of attraction in the region and many devotees visit here to offer prayer to the Sun God. The Katarmal Sun temple is a major pilgrimage centre and attracts thousands of Sun God devotes every year from different parts of the country & world. The Katarmal Sun temple is now protected and preserved by the Archeological Survey of India and the government is also constructing road and can be easily accessed by foot as a small beautiful trek among the thick deodars leads you to the Sun Katarmal Temple.